Dress to impress! 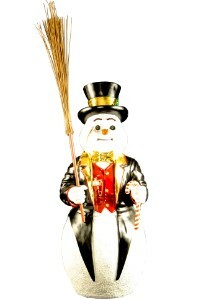 Frosty the Snowman is ready to join your Christmas display. This item is perfect for Christmas enthusiasts and decorating extremists! He stands 4' tall. He is dressed to impress including his traditional black top hat. It is perfect for any large Christmas display or for general holiday decorating, especially in commercial areas such as shopping malls, supermarkets, and banks. It is crafted with fiberglass and polyresin. This item is UV stabilized.